Are you paying to create this hell, to have animals harmed and killed on your behalf? If you’re consuming animal foods and products, then, indeed, you are. 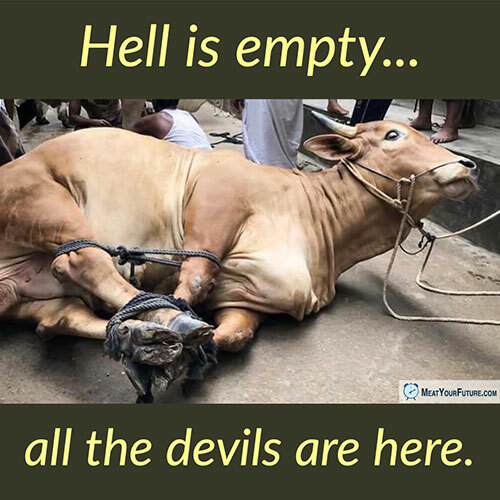 Animals are slaughtered in fear and desperation, in pain and agony, simply because we chose to eat, wear and use them, despite the fact that we don’t need to. We have no biological need to eat any animal foods for our health. We can live healthy lives without a single ounce of meat, dairy, eggs or other animal products. In fact, we are healthier avoiding them altogether. So, what is our excuse for continuing this mass violence against countless billions of sentient animals? Convenience? Habit? Pleasure? Tradition? Are any of these worth the horrific suffering and life itself of another? Clearly, not. And is it not obvious looking into this animal’s desperate eyes? Animals are not here *for* us – they are here *with* us. Please meditate on the impact of your daily choices and go vegan – it’s literally the least we can do if we believe other animals matter at all.